Just to reaffirm that old dogs can still learn new tricks, how's this news: I'm reading Ken Follett's latest book in Spanish. Yes, 16 months after landing in a Spanish-speaking country with Spanish-language skills that were not much more than tourist grade, I am now making my way through an epic set in the pre-war years as Hitler rises to power. And I'm understanding it (well, mostly). I've loved this time in Honduras for all kinds of reasons. 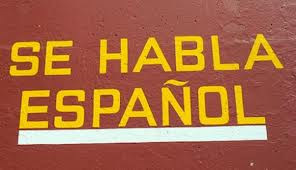 But I think I might love it most for the opportunity it has given me to finally fulfill my dream to learn Spanish. Ever since my daughter Regan won a trip for two to Acapulco in 1993 and took me, I have wanted to be able to communicate in this beautiful language. Every time my spouse and I went back to Mexico for one holiday after another, I yearned for the day when I could just sit on a bus and understand the melodic conversations going on around me. OK, I'm not quite there yet - last night when I was travelling in a car with a bunch of my co-workers, there were large chunks of their conversation that I couldn't get. I'll know that I'm genuinely fluent when I can a) Understand a group of friends chatting amiably to each other; and b) Comprehend everything said in a tele-novela episode. But still, things have come a long, long way. People ask me questions and I answer, and no longer do they give me that curious look that signals that I clearly didn't understand what they were asking. I chat with cab drivers, shop owners, restaurant staff, campesinos (people from the country are very challenging to understand). I ask all the pent-up questions I've had inside me for years, my inner journalist at last free to emerge in both English and Spanish. That's not to say I don't make mistakes, mind you. In fact, I probably make more than ever, given that I'm speaking more than ever. But at least I hear most of them now, and know how to correct them. And while it's always a bit embarrassing to have to blunder around in a new language, the truth is that the more I speak, the better I get. Like everything else, learning a new language really comes down to practise, practise, practise. The best thing I ever did was start reading out loud. I now do this for at least 10 minutes every day. I don't know what it is about it, but it really works. For one thing, it forces you to hear your own pronunciation and adjust accordingly. But there's also something about the Spanish words falling on your own ears. It's like it triggers something in your brain and makes it easier to understand others speaking Spanish. All those primary-school teachers hounding us to stand up and read out loud obviously knew what they were doing. I find myself in many situations through my work where I have to take notes, very familiar to me after all my years in journalism. Increasingly, I'm trying to take those notes in Spanish rather than jot in English and translate later. It's much harder and slower, but again, it seems to me that it opens up some new language pathway in my brain when I do that. Immersion is obviously a critical part of all this progress. How wonderful to have landed in a workplace where nobody spoke English. While it made for a stressful couple of months, I am so grateful to have had no choice but to figure things out in Spanish. And how wonderful that Cuso International took a chance on me. They gambled that they could put me into a position that I didn't have the language skills for and I would pick it up from there. I don't know if I would have had that same level of confidence in me, but I'm very glad that Cuso did. So go on, old dogs, get out there and learn new tricks. Our dreams aren't getting any younger. What's it going to take to set things right?